REDMOND, Wash., April 8, 2019 /PRNewswire/ — On April 13 thousands will join the “Megathon” event from home and in public meetups nationwide to help speed up Alzheimer’s research from Cornell University. Participants will analyze scientific data through the Stall Catchers online game, with the result of a year’s worth of research concerning cardiovascular risk factors in Alzheimer’s to be announced at the end of the event. Cornell scientists have recently discovered a way to restore memory in mice with Alzheimer’s disease, by removing “stalls” – clogged blood vessels in the brain. But mounds of data still need to be analyzed in order to find a safe intervention for humans. The task – distinguishing which vessels are flowing and which are stalled – can only be done accurately by the human eye. Stall Catchers is an online game founded by the Human Computation Institute in 2016 to tackle this problem by delegating the visual task to “the crowd”, which, as it turns out, can contribute to this research with very high accuracy. 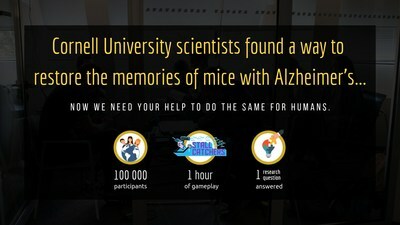 Since its inception, the game has gained over 16 000 users, and helped answer multiple research questions concerning the role of brain blood flow in Alzheimer’s disease. In partnership with SciStarter, and with support from BrightFocus Foundation, the National Network of Libraries of Medicine, Microsoft Research, and others, Stall Catchers is going “MEGA” this April. Thousands of participants across the country, as well as dedicated international “catchers” on other continents, will join forces for one hour to analyze 67,000 blood vessels – which would otherwise take an entire year in the lab. The answer to a key research question related to preventing Alzheimer’s disease will be reported on the livestream at the end of the event. The Megathon (megathon.us) will take place on April 13, 1.30-3.30pm ET in hundreds of locations. Anyone can join the event by finding a location near them via SciStarter.com, hosting their own meetup or simply joining online from home during the event. The Megathon “headquarters” will be hosted at the Microsoft Redmond Campus and kicked off by Microsoft Chief Data Analytics Officer, John Kahan. An esteemed panel of speakers will include the director of the Human Computation Institute, Pietro Michelucci (host), Alzheimer’s Speaks Radio’s Lori La Bey, and Cornell University’s Chris Schaffer. Remote participants will be joining via a live stream from other Megathon locations. Human Computation Institute (HCI) is dedicated to advancing the science of crowd-powered systems for the betterment of humanity. The institute developed Stall Catchers – an online game that uses the power of the crowd as a way to tackle Alzheimer’s disease.